If you're, say, visiting Munich or Salzburg, and want to take a short sightseeing trip that could include hiking, boating, or simply standing in awe of the beauty of the Alps, then check this place out! Situated in the far southeast corner of the German state of Bavaria, this little gem is perfectly shoved between the narrow pass of two jagged, alpine mountains. Lake Konnigsee is in the Berchtesgarden National Park, and while it's a relatively small body of water, it happens to be Germany's third deepest lake (random facts from wikipedia). 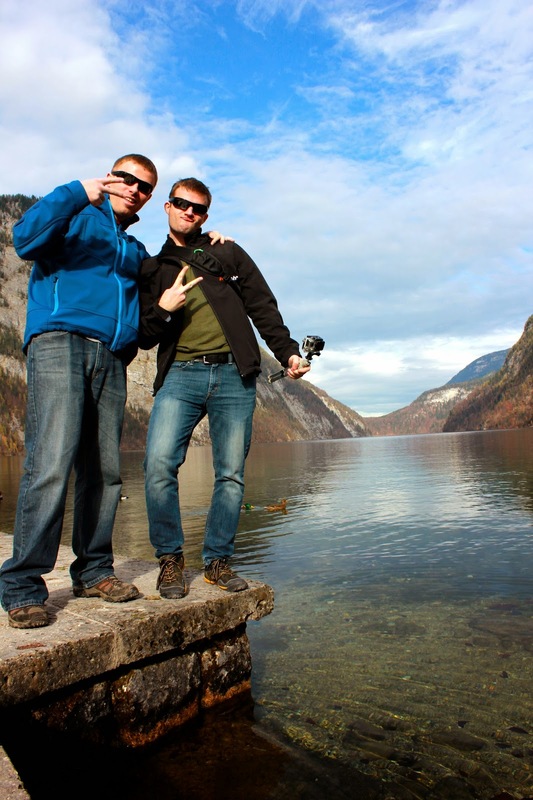 At the end of last year, Chris and I had just moved to Regensburg, and Reece suggested a quick trip down to see the breathtaking Konnigsee (which literally translates to "king's lake"). We never hesitate when a new sightseeing destination is on the table, so naturally, we packed the car and headed south. The first thing you notice when walking up to the lake is the intense, aqua-green color of the water, oh and it's strangely clean. The lake is so clean in fact that it is said to be the cleanest lake in all of Germany. In order to keep up appearances, no fuel powered boats are allowed on the lake. In the summer, get extra exercise by rowing or paddling your way around the crystal clear lake, or do what we did, and take an electric powered passenger boat tour. If I remember correctly, the boat will put you back 12 - 18 Euros depending on the duration of the boat tour that you choose. We got off the boat at the beautiful, red domed church named St. Barthomoma, and we enjoyed a local beer at a nearby restaurant. And naturally, I took a million pictures. We didn't have time to take a long hike, but next time we visit, I really want to hike Mount Jenner. I think it would be absolutely incredible to see Lake Konnigsee from above! Hopefully we will have time to go this summer! Another thing that we really want to see is Hitler's Eagles Nest, and if you're in this area, you're too close not to visit this historic piece of German history. Unfortunately, you can only reach it by bus or by hiking for 2-3 hours. If you want to figure out how to get to The Eagle's Nest, I found this post quite helpful. From the parking lot of Lake Konnigsee, on a clear day, you can see The Eagles Nest. If you look at the last picture in this post, you will see it in the top left hand corner. You'll really have to look closely!